Introduce a fully integrated rail and rapid transit network that connects our main centres with quick, frequent services, and which is connected into wider local bus networks through high quality multi-modal interchanges. Increase the number of people that are within 45 minutes travel time by public transport to a minimum of three main centres and the two HS2 stations. Reduce transport’s impact on our environment – improving air quality, reducing carbon emissions and improving road safety. Ensure that walking and cycling are a safe and attractive option for many journeys especially short journeys below 1 or 2 miles, by delivering a strategic cycle network and enhancing local conditions for active travel. Facilitate the efficient movement of people on our transport networks to enable access to education and employment opportunities and health and leisure services. Enable businesses to connect to supply chains, key markets and strategic gateways through improved strategic connections by road and rail . 2) A long term approach based on making better use of existing road and rail capacity, more public transport capacity, limited new highway capacity, better junctions at bottlenecks, a new strategic cycle network joined-up with local cycle networks and improved conditions for walking. All integrated with smart technology. 3) Ways to fund a long term programme of projects is set out, alongside a set of performance indicators to allow us to measure our successes. The success of this plan will be very much down to how the negotiations with Central Government go on the establishment of the West Midlands Combined Authority and the associated devolution deal. 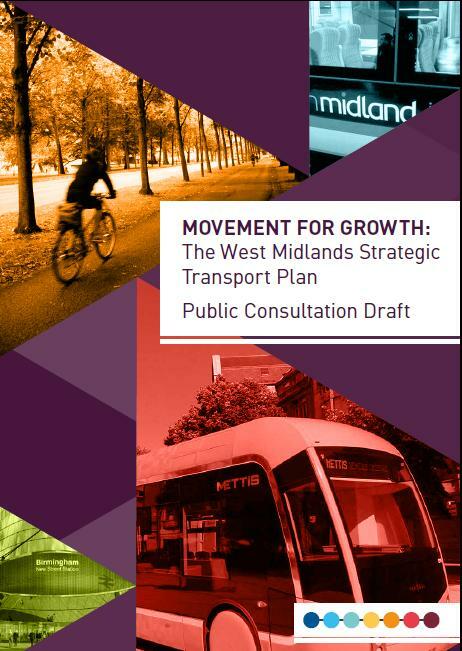 It is clear within the draft negotiating document related to the devolution deal that powers to raise monies – to help fund the significant transport plans contained within this strategy are being sought and are vital to the plans delivery.